If you have a small child and enjoy walking, but don't enjoy carrying said child then this is about the best money can get you. 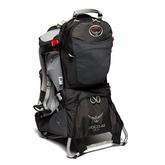 The Osprey Poco AG Plus Child Carrier is constructed with both the child and the carrier in mind, resulting in an exceptionally comfortable setup for both. The suspended Anti-Gravity™ system controls momentum when weight is being transferred, promoting carrying confidence, whilst the comprehensive child safety harness ensures they stay secure and in place, without restricting movement. The Fit-on-the-Fly™ hipbelt allows for complete carrying customisation. Deal posting newbie! This is jedijoe first deal post. Help out by leaving a posting tip or just to show your appreciation for their contribution.